On the strength of its 42 years of experience, Gardaland Resort is today one of the most beloved destination by Italian and foreign tourists alike. With its two hotels – Gardaland Hotel and Gardaland Adventure Hotel – Italy’s Number 1 Amusement Park and a magnificent Aquarium - Gardaland SEA LIFE Aquarium – this Resort, located on the banks of the Garda lake, attracts and favours European tourism, recording an influx of visitors that is constantly increasing. Gardaland Resort deploys every year the development of new attractions and of a wide array of initiatives, offers and facilitations to keep nurturing the interest of its Guests while demonstrating its right to be considered a Park at the forefront of the market and on a par with the most important Parks at international level. The Resort represents today an ever-rising unmissable destination. 2016 reached its conclusion on the most positive of notes, registering a significant increase of Italian and foreign presences, thus confirming our visitors’ appreciation of the Park and of our entire offer. From the Tripadvisor ranking of the most visited and beloved sites in Italy in 2016, Gardaland ranks 1st in Italy and 7th in Europe! The size of the Park, the over 40 attractions suitable for visitors of all ages, the great variety of shows and live entertainment, the 5,000 creatures of Gardaland SEA LIFE Aquarium and the fantastic experiences that the whole Resort offers are all one big invitation to dedicate more and more time to fun and amusement. To encourage Guests to come back as much as possible every single entity of the Resort, every year, gets involved to offer interesting opportunities. The Park reaches a wide, heterogeneous target; 70% of its visitors are families while the remaining 30% is made of teens and youngsters between 15 and 24 years of age. The attractions of the Park are suitable for amusement aficionados of all ages and, for this precise reason, they are divided by typology: “Adrenaline”, “Adventure” and “Fantasy”. There are also numerous itinerant shows and spectacles inside theatres but there is also no shortage of large and fresh green areas for pleasant, relaxing breaks. 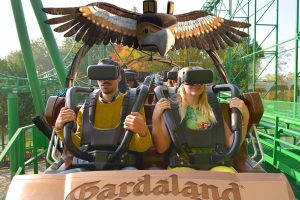 For season 2017 – kicking off on Saturday 8th April - Gardaland is getting ready to present the incredible new addition - SHAMAN - which sees Virtual Reality applied to the Park’s legendary Rollercoaster: an extraordinarily immersive adventure, an unprecedented offer by Italy’s Number 1 Amusement Park. Thanks to Virtual Reality viewers applied to the Park’s legendary Rollercoaster, the passengers will be transported to a spectacular flight into the world of spirits of Native Americans. For thousands of years the Tribes of the Rocky Mountains, guided by the Shaman Chief, went through an incredible ritual to venture the world of the their ancestors’ spirits. Aboard SHAMAN the fearless passengers will find themselves “virtually” sitting on a wooden log, where Native Americans have carved the stylised head of an eagle and they will face the first part of the track surrounded by rocks and totems. The log will then turn into a real eagle that will embark on a spectacular flight after crossing the dreamcatcher, the evocative symbol of Native American culture, an item that represents the portal to reach the world of Spirits! As a result… the double loop, the two tailspins and the final helix that characterise the attraction will become out and out aerial acrobatics! Along with the emotions on SHAMAN and on the Park’s other attractions, there will plenty of opportunities to take part in involving theatrical shows. Gardaland, alongside the traditional brand of fun offered by the attractions, will present a multitude of compelling shows and live entertainment events throughout the day. In the new season Gardaland’s cast of artists will once again bring on stage moments of unforgettable happiness: at the Palatenda it will be time for “Romeo, le formidable”, a new comedy show where Kevin Huesca, ventriloquist of international stature will play the part of a wacky character accompanied by an aerial acrobat and by ballet dancers. At Gardaland Theatre the brand new show “Pearl of the Orient”, inspired by Chinese folklore, offers spectators the ancient acrobatic tradition of the Country that recreates, with the aid of the corps de ballet, the mythological atmosphere of the famous Chinese dragon. The amazing themed aquarium located beside the Park offers a relaxing break that brings together fun and awareness of sea protection. We are talking about a unique experience in its kind to be enjoyed among the over 5,000 marine creatures that populate the 40 themed tanks, from the most famous ones to the strangest and most exotic ones… Some examples: the beauty of jellyfish will be admirable from up-close, thanks to a new, specially designed tank; you will also be able to “dive” into the deepness of the Ocean thanks to the transparent underwater tunnel that gives visitors the impression of walking among the abysses: a huge number of species will be on display, sharks especially! This year visitors will remain enchanted by the bowmouth guitarfish, an unusual specimen with an odd, almost prehistorical shape, like a cross between a shark and a ray. Watch it swimming with great elegance in the oceanic tank! 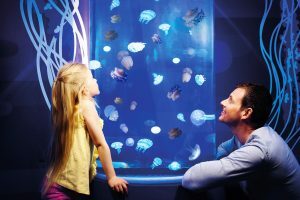 Among the many new additions of the new season Guests will also be able to partake in a little excursion through the ecosystem of the Amazon rainforest: a wholly themed room will recreate this particular setting where you will enjoy close encounters with many organisms such as piranhas, archerfish, pufferfish and cardinalfish. Every day, at 12 AM and 3 PM, you will be able to witness the presentation of “Il Regno dei Leoni Marini” (The Reign of sea lions) while at 11 AM and 4 PM it will be time for shark feeding. Gardaland Hotel, with its New England-style, can boast 247 rooms and it is the epitome of fantasy, dream, enchantment and fairy tales. Since its opening Gardaland Hotel has seen continuous and constant growth in terms of room occupancy rate thanks to the numerous offers and the convenient packages dedicated to families. The hotel comes with several themed rooms inspired by many different themes: from the Kung Fu Panda-themed room to the one inspired by the world of SEA LIFE, from the Happy Circus one to the Pirates Cove one, from the Magic House themed room to the Oblivion one. Every year the Hotel presents new additions and this year will be no different, with important changes having taken place: the renovation of the Classic rooms, the increase in the number of Princess Kingdom rooms – always very popular with little girls and very requested – and the new Snow Princess, rooms themed after the Snow Principess. Inside Gardaland Hotel, the new addition of the new season is MATKA, the new gourmet restaurant that seeks to titillate the palate of its Guests all year long. The structure is open also to those not staying overnight at the hotel and it offers an exclusive and enchanting location, accompanying food connoisseurs along a gastronomic and sensorial path in an intimate, elegant and refined environment for a unique and memorable experience. MATKA is open from the 7th April – from Thursday to Tuesday - from 7.30 to 10 PM; openings on request are available at lunchtime for special events, subject to a minimum number of people (to be agreed). The only wholly themed hotel in Italy and jewel in the crown of the whole Merlin Group - second in the world in the amusement sector - Gardaland Adventure Hotel is made of two pavilions that host 100 themed rooms, with settings that are inspired by the different worlds of adventure present inside the Park. From the luxurious jungle to the wild west, from the arctic, among ice and mammoths, to Arabian atmospheres that look out of “One thousand and one nights”: Jungle Adventure, Wild West Adventure, Arctic Adventure and Arabian Adventure. Inside the new structure we can also find the highly original Tutankhamon Restaurant. Wholly themed and unique in its kind it is open to anyone – even those not staying at the Hotel - and it offers the opportunity to dine among the walls of an ancient and imposing Egyptian temple, discovering delicious dishes served in an original atmosphere and accompanied by live entertainment. Both hotels take advantage of a scenic aquatic area - the Blue Lagoon - a real oasis of 3,000 square metres immersed in luxurious vegetation. The area can boast a large hydro massage area, a choreographic waterfall and a special pool for children, with its own special live entertainment in perfect Gardaland style. Blue Lagoon is the ideal place to dive into after a multitude of emotions at the Park, perfect for pleasurable breaks during the hottest hours of the day. At Gardaland Hotel you will be able to book your own holidays taking advantage of the convenient package for families named “Gardaland Happy Easter”. The package – which can be booked for the 15th and 16th April (2 nights) includes: in-room Welcome setup (on the day of arrival), 2 night stays and international buffet breakfast, 2 buffet dinners at the Wonder Restaurant (drinks not included), Easter eggs with original surprises courtesy of Prezzemolo and his Friends (in-room, one per each booked paying child); and also 1 combined ticket per each person which includes 1 day at Gardaland Park and 1 day at Gardaland SEA LIFE Aquarium (one per person). Price in standard double Classic room starting from 337 € per night (2 adults and 1 child from 3 to 12 years of age). Gardaland Adventure Hotel is also awaiting its Guests for the Easter holidays, offering the “Gardaland Happy Easter” package that includes: welcome drink (on the day of arrival), 2 night stays and international buffet breakfast , 2 dinners at the Tutankhamon Restaurant (three courses of your choice, drinks not included), Easter eggs (in-room, one per each booked paying child), combined ticket: 1 day at Gardaland Park and 1 day at Gardaland SEA LIFE Aquarium (one for every person). Price for the themed room starting from 420.00 € per night (2 adults and 1 child from 3 to 12 years of age). Gardaland Hotel offers the “Gardaland All Inclusive” package that includes: 1 night stay, minibar, international buffet breakfast at the Wonder Restaurant, Buffet dinner at the Wonder Restaurant (drinks not included), entry ticket to Gardaland Park and Gardaland SEA LIFE Aquarium (1 entry per person). The ticket grants 1 entry to Gardaland Park and 1 entry to Gardaland SEA LIFE Aquarium on the same day or on 2 consecutive days). Price for a standard double Classic room starting from 440,00 € per night (2 adults and 1 child from 3 to 12 years of age, for example for a weekend in May). Gardaland Adventure Hotel offers the “Gardaland Happy Birthday” package to celebrate a truly legendary birthday! The package includes: 1 night stay, special gift in camera on arrival, 1 free ticket for the person celebrating the birthday: 1 day at Gardaland Park and 1 day at Gardaland SEA LIFE Aquarium. In addition a combined ticket for the accompanying parties (1 day at Gardaland Park and 1 day at Gardaland SEA LIFE Aquarium). Price for a themed room starting from 255.00 € per night (2 adults and 1 child from 3 to 12 years of age, for example for a weekend in May).